Choosing healthy tropical plants for your home or office is the first step to enjoying a trouble-free, long-lasting experience with indoor plants. Many of the problems we are frequently asked about can be eliminated by starting with quality tropical plants. Most of the tropical plants available for purchase in the GTA have been grown in Florida by specialized growers. These growers may sell directly to large retailers, or may sell through distributors. A few varieties of plants are grown in Canada in greenhouses. Many flowering plants such as orchids and bromeliads are grown in Canada. Most of the plants you see for sale in the grocery and big box stores have been shipped in massive quantities to the retailer’s main warehouse. The plants are held here for a short period of time, and then shipped to the stores. The plants are not taken care of during this process. They often reach the stores in poor condition, and then are minimally cared for until sold. Staff in these stores are not trained in horticulture. As a result, the plants are stressed, and prone to disease and insect infestation. Insects spread rapidly in these conditions, often affecting entire shipments. Here are a few tips on choosing healthy tropical plants. Look for plants the have abundant leaves. The leaves should appear strong and full, without any yellow or brown tips. Check for any mottled or chewed looking leaves. This could be a sign of an insect issue. Check the underside of the leaves; common insects may appear as brown bumps (scale), white, fluffy clusters (mealy bug), or tiny green or brown flecks. Touch the soil around the plant. Fungus gnats if present will fly out of the soil when you disturb it. 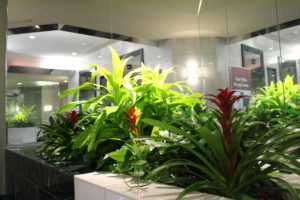 If you are looking for plants for your office, consider hiring a professional interior landscape contractor. Your contractor will have the training and experience to suggest the right plants for your office . They will be connected with a high quality supplier, and will guaranteed the plants if they maintain them on a regular basis.